Christopher and Kristin Booty attend Mass at Blessed Sacrament Church in Oakland Park with their babies, Catherine and Maythan. The family are Muslims and are converting to Catholicism. They will all be baptized during the Easter Vigil. OAKLAND PARK | Muslim Christopher Booty questioned the religion he practiced, so he looked back into history, tracing the roots of Islam and other world religions. When he met up with Jesus Christ and learned about God’s mercy, he was hooked. Christopher and his wife, Kristin, are being baptized during the Easter Vigil at Blessed Sacrament Church in Oakland Park this year. Their daughter, 8-month-old Catherine, and their son, Maytham, who will be 3 in May, will also be baptized and welcomed into the Catholic Church. The Bootys’ story is unique. A native of Broward and practicing Muslim, Christopher, 28, married his Muslim wife Kristin, 27, five years ago. Part Irish and a little English, Christopher grew up without spiritual guidance or a Christian community, and as a teen, he explored various organizations in a full-fledged search for a home. Kristin is from a tiny village in the Canadian mountains. “I was raised agnostic,” she said about growing up without faith — only the belief that it is impossible to know whether there is a God or a future life. Kristin needed something more solid, something more concrete. Christopher and Kristin met through Facebook. They continued to have conversations online and through Skype, and at the end of 2013, they finally arranged a meeting near the Canadian and U.S. border. It was love at first sight, and they felt like it was a solid match. Months later, they married. Kristin moved to South Florida to begin life with her husband. She joined Christopher’s Muslim community to practice Islam and take up the Muslim way of life in South Florida. Adjusting to life in Florida was difficult for Kristin, who came from a town of a little over 1,000 people. Christopher worked several low-paying jobs and then returned to school to further his education. They were living with Christopher’s parents, trying to make ends meet. Father Robert Tywoniak, pastor of Blessed Sacrament Parish in Oakland Park, performs the ancient rites called the scrutinies during Mass March 24. Shown at the altar are Christopher and Kristin Booty. Both Christopher and his wife are Muslims who will be baptized into the Catholic Church during the Easter Vigil. Both he and Kristin found themselves growing distant from the members of the Islamic group they belonged to. They also found it increasingly difficult to live the Islamic lifestyle, which includes guidelines and directions for virtually every aspect of life, from socializing to praying five times a day. He dug a little deeper and went back further in history, tracing the roots of Christianity and the ministry of Jesus, filled with healing, love, compassion and mercy. “Even though that was 2,000 years ago, the historical documents are there. You see something is going on. They are talking about Christ,” he said. 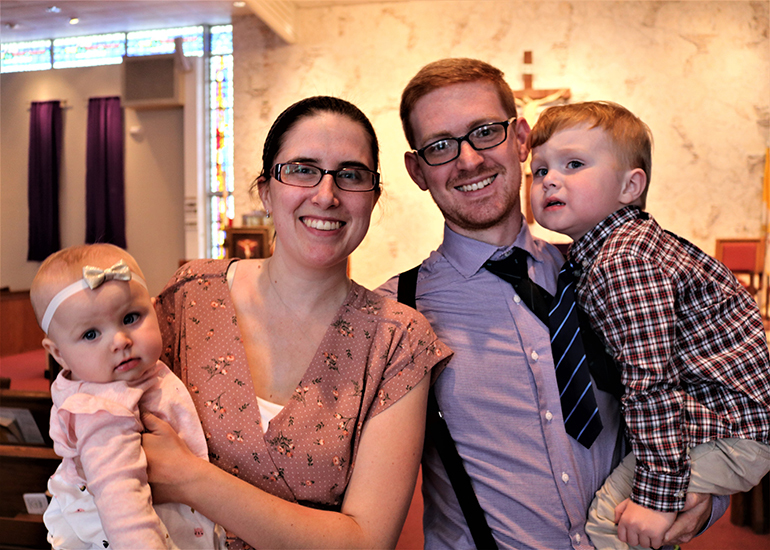 Kristin and Christopher visited Blessed Sacrament Church a year ago after finding the parish’s welcoming website online. Maytham was nearly two then, and Kristin was five months pregnant with Catherine. Christopher and Kristin entered the Rite of Christian Initiation of Adults (RCIA) in September and began the journey to the Catholic Church slowly, step by step; first learning about the beliefs and practices, then continuing to discern whether to embrace the faith. 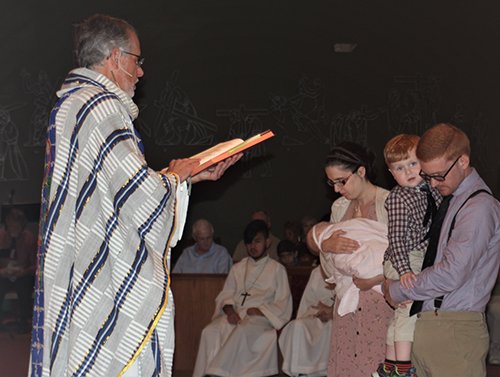 As part of their process, the family visited St. Mary Cathedral the first Sunday of Lent, where they affirmed their intention — and were accepted — to join the Church during the Rite of Election. During Lent, they participated in ancient rites called “scrutinies” which encourage repentance and change in preparation for the Easter Vigil. The Bootys’ story, while unusual, also is timely in the era of “nones” — younger generations who identify with no religion. Christopher’s own roots and history include parents who did not practice any faith, although his mother was born to a Methodist family and his father was Catholic. He shared stories about his great grandfather, a building superintendent at the Basilica of the National Shrine of the Immaculate Conception. “We visited the basilica,” said Christopher about a recent trip he made with his wife to Washington D.C. and the mother church of America. His grandfather’s name is inscribed there on a memorial along with that of other faithful Catholics, a family legacy for generations to come.